The diagram below shows the typical procedure used for surveying a section of river when working upstream with an electrofishing backpack (although this is not always necessary, and downstream fishing has been shown to also be effective). 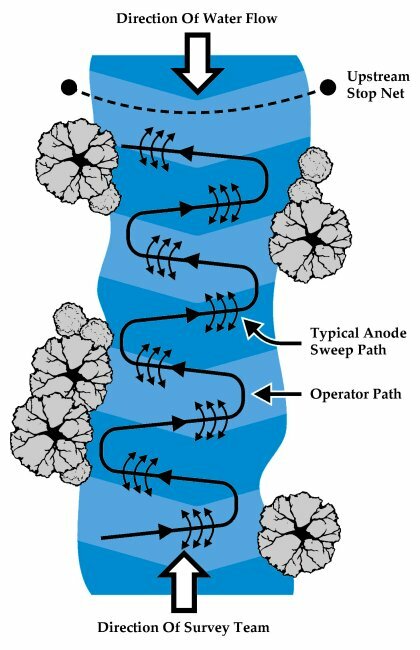 The operator should walk in a zig-zag pattern across the water-course sweeping the anode in front of them across their path. Optionally the operator may choose to also use a catch net to capture and transfer to the fish holding bucket. A team member should accompany the operator with a catch net and fish holding bucket. Where possible, you should fish in a discontinuous manner, briefly switching off the anode at intervals (whilst keeping it in the water) such that fish are not driven ahead of the fishing team. For survey work, it may be desirable to erect an upstream stop net to further fish entering the survey zone. Please note that the E-Fish backpack is only suitable for wading fishing operations and should not be used from a boat or in combination with other electrofishing systems. Do not allow unprotected parts of the body to come into contact with the water. Only the backpack and anode operator should remove debris from the electrodes (anode ring and cathode tail), when they are sure the system is de-energised (and the Stop button is locked in). Do not allow the anode ring to leave the water. Do not leave any live equipment unattended. Do not simultaneously use more than one set of electrofishing equipment. Never restrict access to the Stop button on the backpack. E-Fish (UK) Limited gratefully acknowledge the information supplied by the UK Environment Agency from which sections of the content of this article have been reproduced or adapted. Please Note that the content of these pages is for general information purposes only and does not constitute ‘advice’. Readers should always consult their specific product documentation, and seek the advice of an appropriately qualified professional before undertaking any electrofishing activity. For further information, please refer to our “Disclaimer” page.